For the price of one globally filed patent, one can likely file 10 new patents in a single jurisdiction. For a business with budget constraints, the result is trying to find the balance between a broader portfolio of unique patents or a large global portfolio covering only a few inventions. For one or two applications this decision may be manageable, but for larger portfolios if they are not managed the foreign-filing costs will quickly outpace new filings and potentially impact the finances for continued new growth. 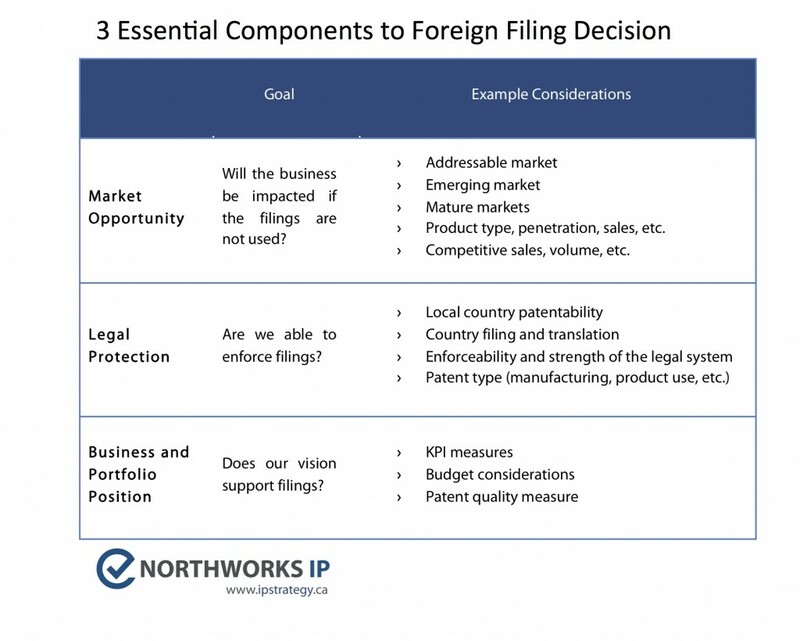 In a patent strategy, the foreign-filing plan is important to consider from a financial-expenditure and business-use perspective. Thus, the development of a comprehensive foreign-filing roadmap and decision matrix is recommended to aid in a business unit or corporate filing process. The first key benefit of a foreign-filing roadmap is the ability to project and forecast multi-year financial requirements of nationalization decisions. The second benefit ensures all nationalizations have business use. The result enables optimization and reduction of maintenance costs of the portfolio. The third benefit relates to institutional knowledge as foreign-filing decisions may occur 12, 18, or even 36 months after the original filing date. As team members move on, the institutional or project knowledge over this time period may be impacted, and a foreign-filing decision plan ensures continuity of knowledge. There are at least three points of view that need to be addressed for each foreign filing or the overall foreign-filing position of the portfolio: market, legal, and business. The end goal is to have a brief business rationale for expansions that can be linked to the company or product sales, realistic legal enforcement capabilities, and the internal business needs. Foreign extension recommended as EP only in mature markets of France, Germany, Italy, Spain, Switzerland, and UK. Key competitor is based in Switzerland with manufacturing plants in Germany, thus EP filing would cover production of competitive products sold and shipped worldwide. Market data indicates emerging markets (India, Brazil, Russia) will be 10+ years before patented technology will be utilized by a large market thus with budget constraints the added costs to support filings in these jurisdictions is not recommended. In addition enforcement in the emerging markets is likely not to occur. In addition to the foreign filing rationale, legal filing strategies around the nationalization should be discussed with counsel. For example filing PCT applications and making a decision on specific countries requiring costly translation fees until after the first search report has been issued. Have a process to generate the market opportunity match, that is built off the existing company’s marketing and sales materials. Have counsel create guidelines for foreign jurisdictions important to the company, and a way to compare the patents to the enforcement ability and other legal issues that need considered. Have management generate a ‘patent portfolio profile’ that new patents for foreign extension can be compared to and prioritized based on budget, KPI’s, and other company criteria. Hi, just got here in your blog while looking for Organisation procedure outsourcing relevant short articles. while scanning your pages I can see your dedication developing a wonderful content not just insightful but in a manner that it is really amusing to check out.